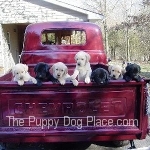 The Labrador Retriever is #1 on the 2011 'AKC Top Breeds' list... and has been in that spot for 20 years! Find out everything you want to know about the much-loved Lab right here. Originally bred as a hunter and water retriever, Labs are still hugely popular gun dogs, as well as being a firm favorite in the family dog arena. When it comes to work, Labradors aren't just excellent hunting companions. They also make superb search and rescue dogs and service dogs..... jobs which they do with enthusiasm and skill, and that well-known grin. 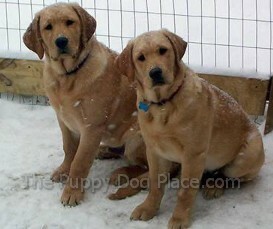 The breed gets it's name from it's birthplace... Labrador, a Province on the east coast of Canada. Originally all Labs were black in color. During the late 1800's the first yellow pup was born in England (at that point these were called 'Golden Labradors'), and the first chocolate colored pups appeared during the 1930's. Color: According to the official breed standard there are three colors.... Black, Yellow (anywhere from light cream to fox red) and Chocolate. Some breeders produce white & silver Lab pups but these are unusual, and are not able to be registered with the AKC. Special Needs: Labrador Retrievers need plenty of exercise, puppies especially LOVE to play. Regular obedience training. The Labrador Retriever is consistently #1 in the popularity stakes for lots of reasons. They're a great all-round dog for families of all shapes and sizes. They're hugely versatile and can excel at competitive obedience, hunting trials, flyball and more. A Lab love the whole world and everyone in it, and they rarely meet a person (or another dog) that they don't like. Friendly, intelligent and eager to please these dogs learn commands quickly and are one of the most straightforward breeds to train. They are an active breed, and regular daily exercise is a must (as is lots of love and attention). 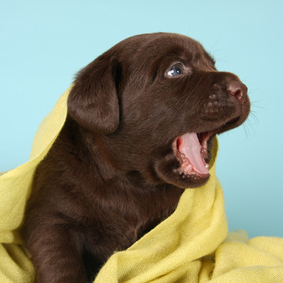 Some Labs can be a little high-strung and nervous, this seems to occur more often in chocolate labs than it does in the black or yellow varieties. BUT it's a genetic trait and this type of personality can show up in a pup of any color. There is quite a noticeable difference in looks between English Labrador Retrievers and those from American lines. In general American labs tend to be lighter in terms of build, and the muzzle is more narrow. These are generally 'Field Lines' which means they're bred primarily as working dogs. As with many other breeds, dogs bred from 'working/field lines' tend to be more high-energy and intense than those from 'show lines'. This means that they're likely to need more exercise, structure and training than those bred basically for shows or as pets. Of course ALL puppies need exercise and training, but show lines or pups bred purely as pets rather than as working dogs are likely to be calmer and less excitable, which makes them a better fit for low-key family life. This photo below shows the difference between the head shape and the muzzle width of the American-style Lab (left) and the English-style (right). 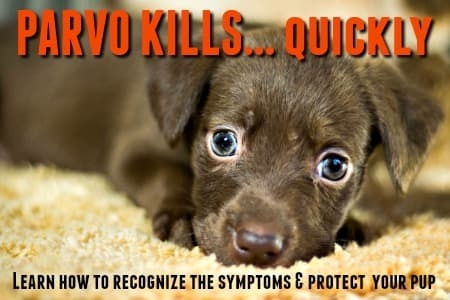 A bored Lab can become very destructive (as can just about a pup of any breed), and the potential damage done by their very strong jaws and powerful urge to chew shouldn't be under-estimated. As a child we owned a Lab who got bored one day while my parents were at work and literally chewed a hole through the kitchen wall! If you want a more laid-back little guy, with the truly blocky, otter-tail type 'look', you're more likely to find him in English bloodlines. 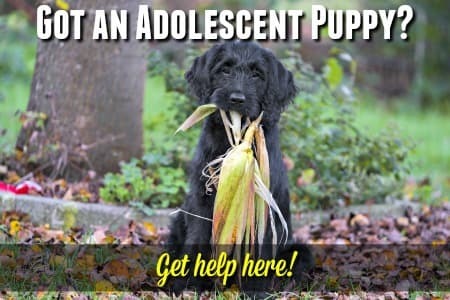 However, neither is 'better' than the other and it's a personal choice which comes down to what your plans are for your Labrador Retriever puppy, and which look you prefer. They're a very 'mouthy' breed, and this can make them 'nippy' as puppies. Luckily they're quick learners and proper no-bite training is usually very effective. They can be inclined to want to eat rocks, sticks and dirt, and often love to carry something around in their mouths (they're hard-wired Retrievers remember!). Lots of sturdy chew toys are also a must for these puppies. One other thing you need to know about this breed, is that they shed! Of course, most dogs shed (unless they're a hairless breed) but some lose more hair than others, Labs are definitely among the 'some'. I'm not sure if there's any 'official' statement on this, but from my experience and research, it would seem that yellow labs are the worse offenders in terms of shedding, and chocolates probably the best (the chocolate coat is often a bit finer and silkier which may account for this). Black labs are somewhere in the middle. Who can resist the cuteness of a Lab puppy? Not me, that's for sure.